“My Place” is a series of blog posts authored by the Counter Tools team that aims to shed light on the impact place has had on each of our lives. In this My Place post, we hear from Executive Director Nina Baltierra. I grew up in Fresno, CA—the center of San Joaquin Valley and, really, the state. While Fresno is home to a great deal of large-scale agricultural production, it’s not all farm land; it’s the 34th most populous city in the US, ranking between Tuscon, AZ and Sacramento. Cher went to high school in Fresno…so there’s that. “Shaw” refers to Shaw Avenue, which runs east/west and divides the city in half—racially and economically—thanks to the railroad tracks Shaw replaced, Depression-era redlining, and suburban sprawl. I found a 2013 dissertation from a PhD student in City and Regional Planning at UC Berkeley called Health Equity in a New Urbanist Environment: Land Use Planning and Community Capacity Building in Fresno, CA (I hope she got that PhD!). 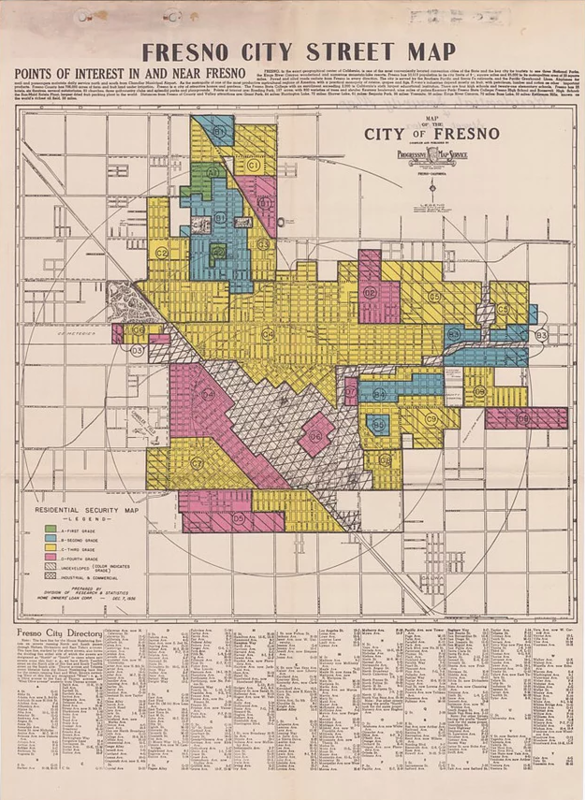 In it, I learned that Fresno’s racial and social segregation is due in large part to historic and sustained land use, which can have major health implications on the populations in those neighborhoods. For example, the majority of the city’s industrial areas are located—you guessed it—south of Shaw. In 2005, the lifetime cancer risk for people living in neighborhoods south of Shaw was 27% higher than those living north of Shaw, likely due in part to there being three times as many tons of toxic chemicals emitted in South Fresno compared to North Fresno. And in 2011, neighborhoods north of Shaw had nearly three times as many acres of parks per capita than neighborhoods south of Shaw. And we know that 1) people are more physically active when they have access to safe, affordable, high-quality space for recreation; and 2) physical activity is critical to prevent and control chronic disease. So to bring it all home (so to speak), in 2011, the average life expectancy for those living south of Shaw was 2 years less than those living north of it. Turns out, the term “South of Shaw” isn’t just slang. It’s a term infused with data and history about the systems of power and (dis)advantage that allowed certain groups of people to settle north of Shaw while it was made virtually impossible for others to do the same. Who knew that a high school student’s go-to insult would become the basis of the work I do now? It shouldn’t matter if you live south of Shaw or in the southern states of the US; everyone deserves the opportunity to live a healthy life in a healthy place. Even Cher. This post was originally published on Nina’s blog.